This all started about four years ago when I started volunteering at Saffyre Sanctuary a horse rescue where a friend of mine was working. She is one of the directors there and I went to visit the sanctuary to help her with some horse whispering. Horse whispering is one of my favorite things to do. You feel filled with so much love because you can psychically feel how deeply grateful the horse are, they know you care. It’s soul touching. John, one of the other directors there joined us as my friend Karen showed me the grounds and introduce me to all their horses. As we were walking around the stalls, John noticed a horse, not belonging to Saffyre Sanctuary, acting strangely about my presence there. I felt it too, it was quite distracting. She was running around the stall lifting her head high and then dropping it low and lifting it again with her eyes locked on me. John believed the horse to be holding a message for me. This horse is named Belle and is a rescue belonging to the owners of the property that Saffyre Sanctuary was renting from at the time. For some silly reason, when John told me that Belle had a message for me I instantly rejected the idea, I thought, oh no, why me. But, like often, I resist the changes that are about to happen in my life and this horse had a message that turned my life around one hundred and eighty degrees. Belle, is a hermaphrodite and cannot mix with any of the other horses due to his or her sudden switching from female hormones to male. The owners warned us, “don’t turn your back on that horse.” We think her erratic behavior is just due to the fact that Belle is a stallion still with testicles on the inside for which there is an easy fix, a three-thousand-dollar surgery to have them removed. Three thousand dollars that no one has for a horse. 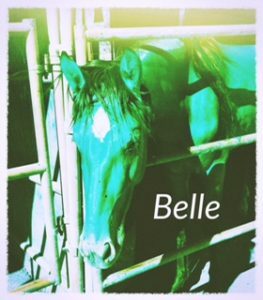 So, there Belle stays, stuck on her or his own in that funky dusty stall in Sun land California. I was suffering a few health problems on the right side of my body at the time. I had just discovered a goiter on the right side of my neck. I was bummed to say the least and I was hell bent on figuring out why it was all just on the right side? Why don’t I have a goiter on the left side too? I couldn’t run anymore due to a slight rip in my right Achilles tendon. I was perplexed, my whole body eats the same food. I thought, if I could figure out why one half of my body was healthy and the other half sick, I could figure out how to heal the side of me that was sick. I asked the universe to send me an answer and it did, through Belle, the hermaphrodite horse. If you have been following me you know that I am a channel to spirit which includes communicating to animals. I love to help animals and although yes, of course, we volunteers are there to care for the horses, soon I found out, as many do who step up to help horses, that I was the one there for help. My next visit to the sanctuary, I was sitting watching the horses in the arena with my friend Karen. I had my back to Belle and Karen was facing her. Karen noticed Belle acting in that strange way again, I was still trying to shut Belle out and push the message away. Karen could see I was acting stiff and resistant. She could tell there was a strange connection between Belle and I and she echoed Johns opinion that Belle had a message for me. Later that evening, after I got home, I sat down in a dark quite room, alone. I closed my eyes and decided to let the message in. What I heard next changed my whole perspective on life and has almost completely healed my right body ailments. Information, I feel obligated to share with others. More soon 🙂 This is a continuing story I am working on about how I came to know all the information about balancing our internal energies. It happened while visiting a horse rescue where I channeled the information through a hermaphrodite horse name Belle. More on what happened next….. maybe tomorrow. I am also writing a book about the balancing information that I channeled through Bell. Feel free to ask questions, contact me, or leave comments.